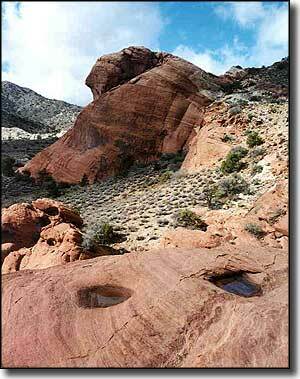 La Madre Mountain Wilderness contains 47,180 acres in the Red Rock Canyon National Conservation Area complex, about 12 miles west of Las Vegas. The Mt. Charleston Wilderness is to the north and the Rainbow Mountain Wilderness to the south. Elevations range from 3,600' to 9,600' at the summit of La Madre Mountain. La Madre Mountain itself dominates this area of rugged canyons, ridges and peaks with steep canyons and spectacular cliffs on its' own southeastern flanks. The Keystone thrust above Brownstone Basin is a great example of thrust faulting where older limestone formations have been pushed up and over younger layers of sandstone. The cross-bedded, red and buff colored sandstone in the Calico Hills, Little Red Rock, Brownstone Basin and White Rock Hills areas is composed of fossilized sand dunes. Vegetation in the area includes everything from Southern Mohave desert shrubbery (yucca, cacti, Joshua tree) to sagebrush to pinon pine and juniper to sub-alpine environments with ponderosa pine and white fir. Wildlife includes bighorn sheep, mule deer, elk, mountain lion, coyote and jackrabbit. La Madre Mountain Wilderness is also filled with ancient cultural sites (rock shelters, agave roasting pits, milling sites, camp sites, lithic scatters and rock art panels), many of which are included in the Brownstone Canyon Archaeological District.